Disc Manager won't capitalize letter a or f in Power2GO 11. I have Power2Go 11 Platinum version 11.0.2712f, SR: P2G180309-08, and for some reason when I go put in my Disc info it will not capitalize the letters a or f. I have to settle for a name with mixed puntcuated letters. I just wanted to see if anyone else discovered this. Thanks. Can you post a screenshot of what you mean so us forum users can test it ourselves? You are saying only two specific letters on your keyboard can't be capitalized? That's correct. The letter a and the letter f when editing the tag in Disc manager will not let you put a capital f or a Capital a. Let me see how I can capture it on a screenshot because I never really use those before that much. That way you can get a sense of what I mean. Basically when you go to edit the tag name in Disc manager and the first letter is an f or a and you wanted to make Capital it will not let you do it. I'll be damned...I get this too. That is one weird bug you found. The workaround for you, while waiting for it to be fixed, is to type the capital F or A in notepad and then copy and paste it in when adding a tag. It won't let me copy/paste or even upload a screenshot, but yes you got it right. Small bug. Quote It won't let me copy/paste or even upload a screenshot, but yes you got it right. Small bug. "how to upload images to the forum"
Quote "how to upload images to the forum"
I tried to use the attachment window below like 3 times and every time I'd get "the file etc... was blocked because of malicious somewhat or another. Is there a limit on newbies being able to use the attachment window? I was on MS Edge. I really do want to post it so others can see. Thanks. 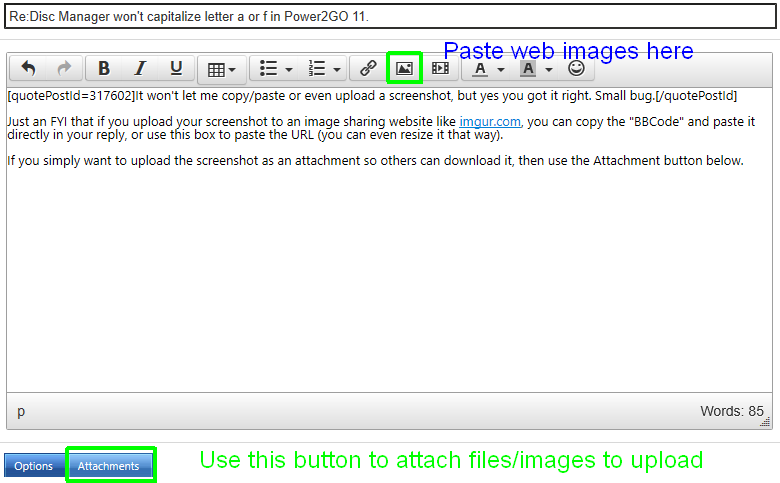 I'm going to se if FireFox lets me upload the screenshot. just use PAINT on your PC. To do this, simply press 'PRINT SCREEN' on your keyboard while the widow of Cyberlink is open, then go to PAINT and press 'CTRL + v (Control & V = paste). Then the screenshot will appear in the Paint. Save as JPEG, GIF or PNG.